We can all agree that the view from Lake Tahoe’s shores—a glittering stretch of blue set against mountain and sky—is stunning. But how does it look from higher up, say 50 feet? Maybe 200 feet? What about up at 4,000 feet above the water? Read on for some of the best ways to take your Tahoe adventure sky high. 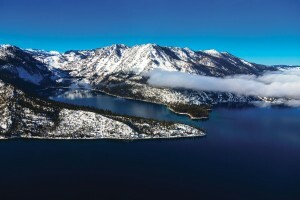 Based out of the South Lake Tahoe Airport, Reno Tahoe Helicopters began offering scenic tours of the Tahoe Basin in late 2005. The fleet includes three-passenger and six-passenger helicopters. “Tours are based on duration,” says administrative assistant Josh Allen. “Most other helicopter tours take all day.” Reno Tahoe Helicopters offers tours as short as ten minutes, taking passengers to Emerald Bay and back. “It’s definitely easier and more affordable,” Allen says. Guests arrive at the airport, where they load in, buckle up and pop on a set of headphones, each equipped with microphones to stay in touch with each other and the pilot. There is no age limit and, like on a plane, children under age two are allowed to ride free on an adult’s lap. The helicopter moves at about 90 to 100 knots, or 100 to 125 miles per hour. “It’s fast compared to a car, slow for an aircraft,” says Allen. Reno Tahoe Helicopters also advertises that it hosts airborne weddings. “We do three a month, on average,” says Allen, though he notes that occasionally, like on last November’s date of 11-12-13, the company performed three in one day. Depending on whether a couple’s marriage certificate is in California or Nevada, the helicopter will take off toward either Emerald Bay or the East Shore to conduct the ceremony. “The joke is, we have a lawyer on staff now, so we also do divorces on the helicopter,” Allen laughs. Tim Shankland opened the Lake Tahoe Flight School in 2010. Shankland learned to fly at age 18 at Western Michigan University; when he moved to Tahoe in 2009, attracted by the natural beauty and the skiing, he wanted to offer others a way to earn their wings. However, he says he also gets plenty of locals who want to pursue a pilot’s license, or who just want to give it a try and are enticed by the $99 introductory special. Introductory flights are about 45 minutes and include a briefing of the instruments and controls. The Lake Tahoe Flight School is the only fixed-wing flight school in the Tahoe Basin, Shankland says, though he adds that there is a flying club in Truckee offering some instruction. For those who want to fly as part of earning a private pilot’s license, the Federal Aviation Administration (FAA) generally requires at least 40 hours of flight experience, though most pilots require between 60 and 70 hours of training. South Lake Tahoe’s Lake Tahoe Balloons runs a unique operation. Founded in 1992, the company offers hot air balloon launches from the surface of The Lake with the Tahoe Flyer, the world’s only U.S. Coast Guard–certified hot air balloon launch and recovery vessel. Guests gather at Tahoe Keys Marina in the early morning (usually between about 5 and 6:45 a.m.) to board the 49-passenger Tahoe Flyer. A continental breakfast is served as the boat cruises to the launch site in the middle of The Lake. Once there, the crew inflates the balloon, first by gas-powered fans, then with burners shooting 15 to 20-foot flames into the heat-resistant polyester fabric. The balloon’s gondola, as the basket is known, holds up to 12 passengers. When it’s ready to ascend, the pilot fires the fuel jets and the balloon rises from lake level up about 3,000 to 4,000 feet in the air for an hour-long ride. With only the occasional sound of the burners and the unbelievable scenery—the swath of blue below and the surrounding peaks of the Sierra Nevada and Carson ranges—a hot air balloon ride is an amazingly tranquil way to fly. Once the tour is over, the balloon gently descends back toward Lake Tahoe’s shimmering waters. The Tahoe Flyer maneuvers itself underneath the balloon, allowing the balloon to gently bump down to where it began on the boat’s upper deck. Soaring in a motorless sailplane, or glider, allows one to experience flight much like a bird. Guests arrive at the Truckee Tahoe Airport, where they can choose from three ride options: The Sierra Vista ride goes the longest (30 to 40 minutes); the Tahoe Vista ride tows up to 3,500 feet above Brockway Summit and the Martis View runs from 15 to 20 minutes. The gliders can accommodate one or two passengers (the combined weight cannot exceed 340 pounds). The passengers and pilot pop on headphones and load into the glider, which is tugged by a towplane up to the desired altitude, where the glider drops the towline. The glider’s wings produce enough lift to balance its weight, and it can catch currents and reach heights of up to 12,000 feet and spectacular views before cruising its way down. He notes, “The middle ride, the Tahoe Vista, might be a better choice for those who are unsure how they’ll react in the air. When in doubt about flying in a glider, I tell them that mornings are calmer and afternoons can be a bit bumpy. Morning rides are usually high tows with a gliding flight around the area and back to the airport. Afternoon rides are better at catching the thermals that the Truckee area is so well known for, and passengers get the full experience of soaring in the high Sierra Nevada. On nice summer afternoons, when there’s a light breeze, colorful canopies of paragliders dot the brilliant blue skies above Kings Beach. Paragliding and hang gliding are similar sports, though in paragliding, the rider is in a seated position and kept aloft by a curved, parachute-like wing, as opposed to hang gliding’s rigid wings and prone positioning. While both sports are found in the area, the portability of paragliding (the equipment folds into a large backpack) makes it more accessible to solo and tandem flyers. In Tahoe, the most popular take-off spot, Daydreams, is accessed by a hike to a ridgetop above Crystal Bay. “It’s about a 25 to 30-minute hike,” says Alex Lacerda, who began paragliding a decade ago in his native Brazil. When he moved to the United States, he chose the Tahoe area due to the mountain thermals so conducive to his sport. Lacerda began flying with other local pilots, and opened Up High Sky Dream Paragliding last year. While he mostly flies at Daydreams, launch locations also include the Slide Mountain side of Mt. Rose and other spots around Reno and the Washoe Valley. Once at the site, riders hook into the tandem rig with the paraglider pilot. After a short run—about 15 feet—the wing catches and the glider rises. Lacerda has flown with riders ages 7 to 75. Though a tandem rig means only one passenger can ride with a pilot, Lacerda works with other local paragliders, including Ed Youmans of Daydreams Paragliding and Mitch Neary of Lake Tahoe Paragliding, to accommodate groups of up to five guests. Rides generally last between 30 and 90 minutes, depending on conditions, before descending to Kings Beach and landing among the beach blankets and sand castles at the shoreline. When it’s time to descend, Hamilton will cut the engine at 10,000 feet and glide down to Washoe Lake, skimming inches off the ground at 80 miles per hour before returning to the Carson City Airport to land. He tries to be done flying before 11 a.m., when the weather is calm. It’s a ubiquitous summertime sight: brightly colored parachutes with passengers dangling beneath, attached to a boat by a long, thin rope—a link between water and sky. Parasailing operators run around The Lake, from Zephyr Cove and the South Shore up to Tahoe City and Kings Beach. Most operations allow from one to three passengers, and will fly children as young as two or three. Passengers are secured in harnesses (which feel much like sitting in a child’s swing) and tethered to the boat with a long hydraulic reel. The boat speeds up; as air catches in the parachute sail and the line lets out, passengers rise higher and higher, flying anywhere from a few hundred to more than 1,000 feet above The Lake’s surface. For those who also want just a taste of the water, operators can often take passengers back to The Lake, dipping their feet in the water before letting them rise again. Unlike many of the other high-flying sports, parasailing is not dependent on time of day or thermal activity. And, an added benefit: When you aren’t flying, you get to cruise along on the boat and admire the view, contrasting the panorama from the ground with the sights from high above. Reno-based writer Alison Bender hopes her summer includes plenty of airborne adventures.